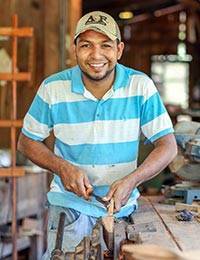 Nicaragua Carpenters design original kitchen utensils with a twist - literally. They carve the seasoned mahogany cutting board by hand, its rich reddish brown hue enhancing the original design with a slight twist at the bottom of the handle. This item can be washed by hand or put in the dishwasher; do not soak.